We love clarified butter. What we don't love is the often-messy process of melting and straining it. Here, chef Thomas Kim of Rabbit Hole in Minneapolis offers an easy alternative. We love clarified butter. It's the pure, creamy, golden result of melting butter and removing the water and milk solids, which gives it a higher smoking point (read: better for pan-frying golden chicken cutlets or Cornish game hens). We also love how perfectly crisp it makes butter cookies with clove sugar. 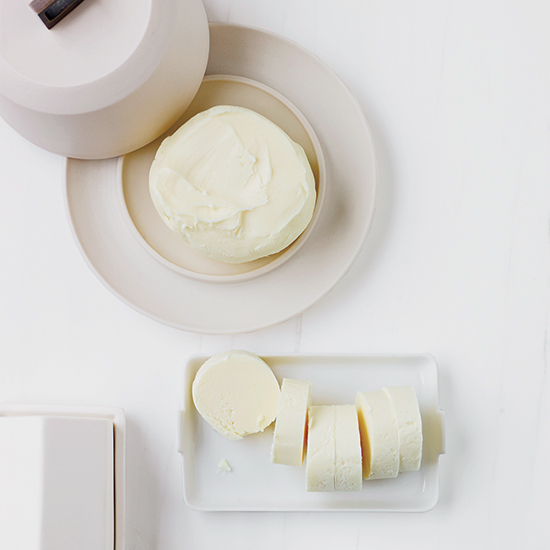 What we don't love is the often-messy process of melting and straining the butter. Here, chef Thomas Kim of Rabbit Hole in Minneapolis offers an easy alternative. "It's much easier to execute at home than straining," he says, "and still pretty reliable." 1. Melt the butter and pour it into a container (preferably one you can see through). 2. Leave it in the fridge overnight to separate and solidify. 3. The next day, skim the surface with a spoon. 4. Using a chopstick or skewer, poke a hole into the butter along the side of the container and pour out the milk solids.